We provide a host of design and consulting services for all phases of underground civil engineering projects, from feasibility studies to innovative design, and engineering support through construction. 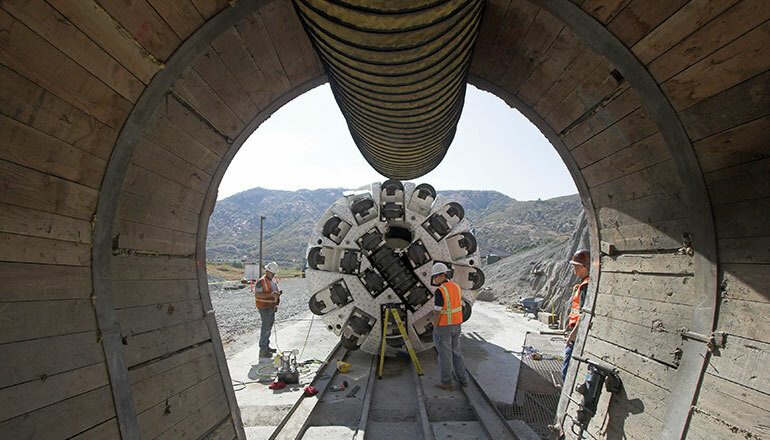 We work directly for government agencies and private sector owners, tunnel contractors, and as a specialty subconsultant to other engineering firms. Our leading-edge designs consider construction methods ranging from open-beam tunnel boring machines (TBMs) for hard rock tunnels, shielded rock machines, earth pressure balance and slurry machines for soft ground, and New Austrian Tunneling Method (NATM) techniques. We are recognized as one of the world’s acknowledged experts in the design of tunnels, deep shafts, temporary works, portal and slope stability, deep foundations, building protection measures, and ground improvement by grouting and dewatering. We have specialized education and practical hands-on field knowledge in the disciplines required for underground projects, including engineering geology, geotechnical engineering, rock mechanics, structural engineering, mining engineering, and construction contracting. We also provide geotechnical investigation and characterization for underground projects. Finally, we understand the construction process at every level. We regularly lead multidisciplinary construction management teams and provide monitoring and tunnel inspection services. Temporary works design is an essential component during many heavy civil construction projects. Often, contractors must create temporary structures that adhere to exacting design and safety criteria — while at the same time being practical and cost-effective. We excel at providing temporary design services for deep shafts, dewatering, slope stabilization, support of in-place utilities, traffic decking and building underpinning. Our temporary works support design services include a complete range of systems: cutter soil mix walls, soldier pile walls, sheet pile walls and cofferdams, internally braced shoring systems, tie-backs, diaphragm slurry walls, secant pile and tangent pile walls, soil mix walls, steel liner plate shafts, mechanically stabilized earth, soil nail walls, rock dowels, anchors, caissons, and ground freezing. We are known internationally for our ability to provide effective construction engineering solutions that are sensitive to project economics, contractual responsibilities, and the physical realities of construction. We are experienced at planning and managing investigations for design and construction in remote areas with difficult access as well as urban areas. Exploration programs are conducted both above and below ground: on city streets, at construction sites, or steep hillsides, over water, and from inside existing underground structures in various geological conditions. An advantage in working with us is our knowledge and ability to utilize the latest trends and technology. We use that knowledge to find a solution not previously identified, or an approach, such as a hybrid of techniques, that provides the best solutions for your projects. Some projects are just unique. As underground design specialists, McMillen Jacobs Associates provides design services for special projects. Our approach is to provide design engineering with the physical realities of construction. We provide solutions to the question: “How can it be built?” We develop engineering solutions that are sensitive to project economics, contractual responsibilities, and the needs of the private owner. Our services include planning and layout, tunnel structural design, geotechnical exploration, fire/safety analysis, and permitting. Significant projects include the 10,000 Year Clock in West Texas, and numerous wine caves, including Chateau Boswell, Palmaz Winery, and Caldwell Winery.